Here are some of my favorite hot cocoa hacks! For a mmmintylicious treat, add a 1/8 tsp mint extract to your mug, and garnish with fresh mint leaves. Or kick-start your cocoa by adding a shot of espresso, along with a sprinkle of cinnamon. Feeling daring? Add a dash of chili powder...it may sound odd, but the complexity and heat are delish! In a large saucepan, heat cream over medium heat until bubbles form around sides of pan (do not boil). Remove from heat; whisk in the chocolates, vanilla, nutmeg and salt until smooth. Return to the heat; cook and stir until heated through. 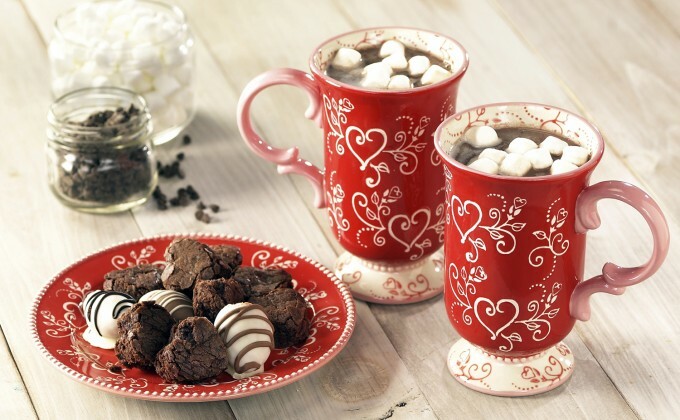 Pour into temp-tations® 16 ounce mugs, top with whipped cream.